1. In windows xp Click Start then Run. 2. Type there gpedit.msc and hit enter. Note: All the above mentioned process is different in windows 7 In windows 7 the below mantioned box in red is actually the Run. 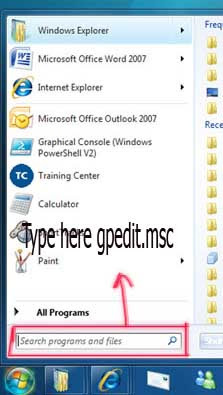 You should type gpedit.msc there and hit enter. 3. Next navigate to "Administrative Templates" -> "Network" -> "QoS Packet Scheduler"
5. Make it "Enabled" (see pic below) and set "Bandwidth limit: 0". Click OK and you are done. So, Thats it. I made it much easy for newbies. Hope you liked it. Drop comments if you have any answer or a new trick.